"On our honeymoon we stayed with some friends in London and they made us this drink - now we can't stop making it! It is especially delicious on a hot, summer afternoon. The cucumber and mint are odd, but don't leave them out - they make this drink!" 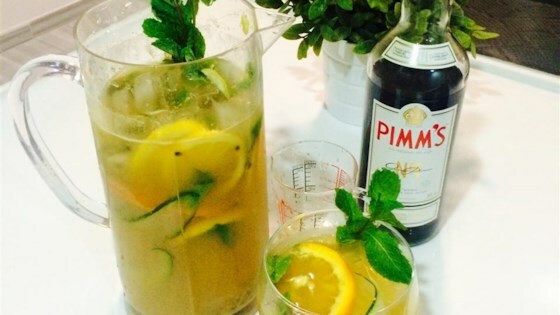 Stir together the Pimm's liqueur and lemonade together in a serving pitcher. Add the cucumber wedge, apple, orange, lemon, lime, pineapple, strawberries, and mint. Refrigerate until cold, or serve over ice. See how to add a smoky, Scotchy twist to the Manhattan cocktail. For all the yummy fruits added, I couldn't taste anything except for the lemonade. A big disappointment. I love pims and lemonade in the summer but i personally dont have the mint and cucumber in it i prefer it fully fruity, the best bit is when u get to eat the highly alcholic oranges at the end! This was a great tipple at a party I had recently. I didn't add strawberries or pineapple, and I added way more cucumber. Brilliant! I can't get Pimm's so I used Bombay gin and it was delicious and refreshing. I omitted the pineapple and poured the gin into glasses then poured the steeped lemonade over that. Lovely! Refreshing and tasty. Not sure why but after a few hours it seemed to get a slight bitter aftertaste. That tells me to make it in smaller batches which works for me. Was really tasty fresh. MMMmmmmmmmm.....very refreshing. Great on a hot afternoon in sunny Las Vegas!!! thanks.